Why be a cop? There's lots of talk about the rewards of police work, but are careers in law enforcement really that great? The short answer is often "Yes!" For all the inherent dangers, there are a good many advantages. Benefits and pay tend to be good and secure, and there's a great deal of personal gratification involved in the job as well. You'll frequently find yourself in positions where you can literally save someone's life. It might be a life-and-death situation that involves pulling a victim out of a crashed car, or providing first aid and basic life support to a shooting victim before paramedics arrive. But aside from these obvious, dramatic examples, your mere presence might save countless lives that you might never know about. Every speeding ticket you write, every fight you break up, and every incident of domestic violence that you respond to might have evolved into a fatality if you hadn't intervened and prevented it. Police officers often encounter people when they're at their worst. Drug addicts, gang members, thieves, spousal abusers, and people who drive under the influence of alcohol or drugs are just a few examples. One of the most satisfying aspects of working as a law enforcement officer is the unique opportunity you'll have to show these people a better way. They're usually a captive audience and, if treated kindly and respectfully, they might listen to what you have to say. How you treat the lowest criminal can play a huge role in whether she makes better life choices in the future. Every day has the potential to be completely different from the one before. There's no better environment than law enforcement for those who hate monotony. Routine can change on a dime. Not only does each shift have the potential to be different from the last, but the opportunities to diversify your job tasks are usually abundant. Are you tired of patrol? Find out what's involved in transferring into investigations. Bored of investigating traffic crashes? Consider working toward becoming a K-9 officer. Law enforcement allows motivated people to try their hand at a host of unique and interesting skills and jobs. Few careers offer the kind of solidarity with coworkers and peers that exists within most police departments. Officers don't just protect and serve society. They have each other's backs as well in a way that's not required in other professions, often in life-or-death moments. Even in the current climate with anti-police sentiments receiving a lot of press, police officers enjoy certain public respect for putting their lives on the line every day. Yes, you'll occasionally chase people, and you might be called upon to outsmart bad guys, but in the end, police work is all about problem-solving. Officers often work with individuals in conflict to come up with often mutually agreeable solutions. With the advent of community-oriented policing, a great deal of police work now involves helping people solve problems to keep them out of the criminal justice system rather than put them in it. It can be immensely satisfying to know that your work serves a greater good. Police work offers many personally rewarding moments, but the knowledge that what you do will hopefully help scores of people, in the long run, is perhaps the greatest intangible reward. Most people are social animals. It's in our DNA to want to help each other. Working as a police officer fulfills this desire while providing an opportunity to support yourself and your family at the same time. Pay raises are typical as officers put in more and more years of service. Retirement benefits and health benefits are superior to those offered by many other professions. And you can live and work anywhere. You'd be hard pressed to find a city, town, county, or state that doesn't employ some type of law enforcement personnel. 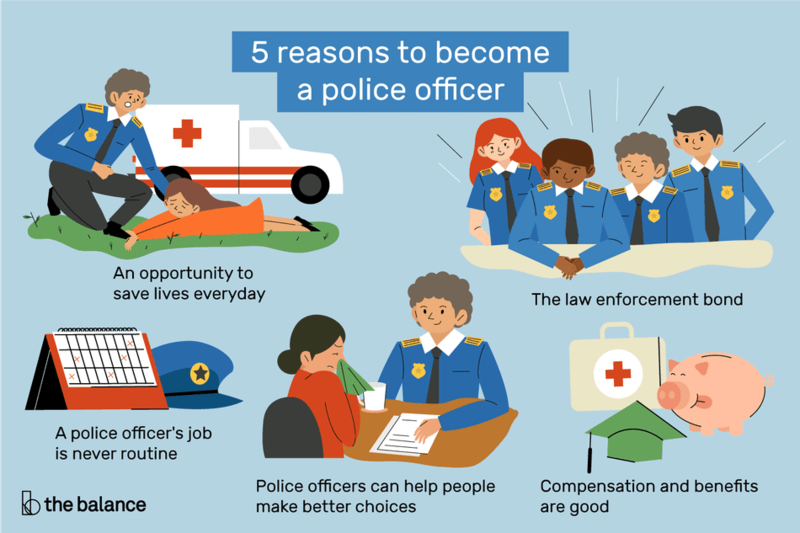 Of course, these are just a few reasons to consider working in law enforcement. If you're looking for a solid career opportunity with some significant rewards, you could do worse than this field.